One-half of the Beards of Denver main cohort traveled to the amazing and ever-exciting state of South Dakota a few weeks ago to celebrate Christmas time, eat entirely too much food, and document a few beards while on location. Mark not only sports an especially impressive beard, he’s also the younger brother of one of the ladies behind BOD. 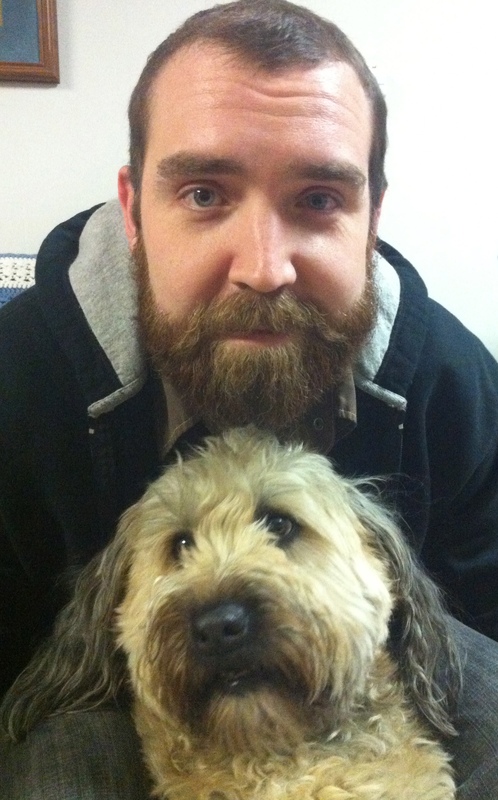 Mark’s been growing his beard the past few months, and is pictured here with the infamous Wheaten Terrier Daisy, who sports her own impressive beard, which she, like Mark, grows out during Beard Season. While Mark resides in Sioux Falls, South D, he does make appearance in Denver, with his next to be sometime in the early half of 2013. When he’s not busy grooming his beard, he’s a connoisseur of Chicken Pot Pies. Keep up the great Beard work, Mark and Daisy! So, I know the man of the mystery, the brother beard, the dude from the heartland of the earth who not only promotes love and peace for all but also drinks beer while promoting it. He is a mystical man and the beard just accentuate the aura that shrouds him. Thank you Mr Bearded man and the person who discoverd him!!! !